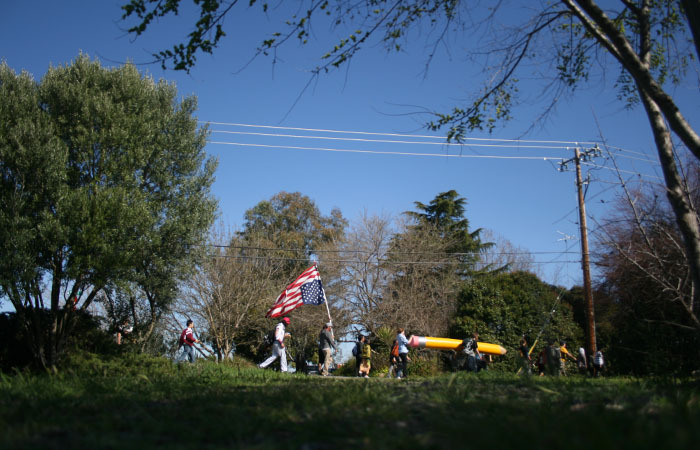 Protestors walk through farm country in Vacaville on the third day of the 99 Mile March to Sacramento. 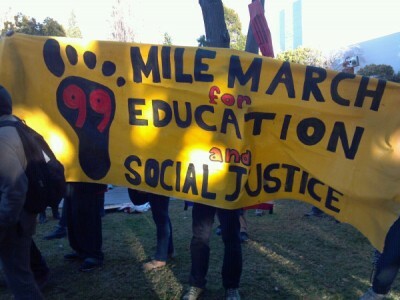 VACAVILLE — Saturday’s leg of the “99 Mile March for Education and Social Justice” took place mostly off road, allowing the marchers to rest up for the 25-mile trek from Vacaville to UC Davis. The day started off with another official send off, this time by Vallejo Vice-Mayor Erin Hannigan. The marchers were then shuttled 14 miles to Solano Community College in Fairfield, where they were met by a contingency of students who provided lunch. From there, the march began on the Fairfield Linear Park Trail, which moved all the way across Fairfield. The breaks taken by the group were extended by long bathroom lines, which made the march go well into the night when it initially intended to be in Vacaville by 5:30 p.m.
Marchers took another off-road path into Vacaville, following the 80 freeway most of the way. They reached St. Paul’s church at about 9 p.m. to shelter and hot food. 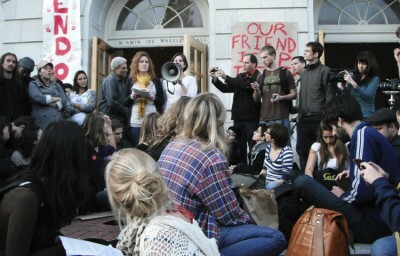 The march set out for UC Davis at approximately 8 a.m. Sunday and will go by bus to Sacramento on Monday for the protest scheduled there.